It’s a clusterfu- oh now i get it! Games are rated on certain aspects, a game might win game of the year because of its popularity or due to the fact that it’s already a big franchise. The thing is that the aspects of gaming I love most are when you find a game that is one simple idea polished to perfection. This is Clustertruck, developed by Landfall Games and published by Tinybuild. Clustertruck is the simple idea of “Hey! 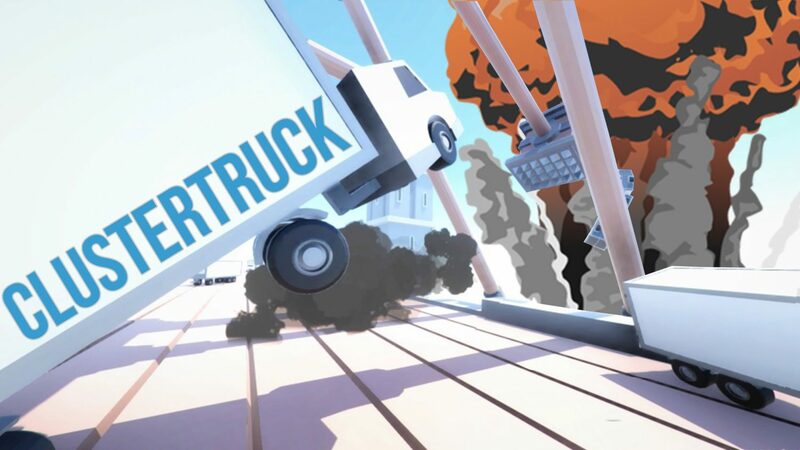 lets put a load of trucks in a level and make someone jump truck to truck to the end, but the truck drivers are drunk or something.” With that one sentence I’ve just explained the whole game. The foundation of it at least, because the developers built a well fleshed out game from that base idea and I love when games do this. It’s all well and good having an in-depth RPG, but finding something so unique like this beats any old secret at the bottom of a cave in The Elder Scrolls: Skyrim or The Witcher. The main feature of Clustertruck (other than the trucks) is the scoring system; the crazier you play, the more points you get. By this I mean that the levels give you points. You gain more points by jumping on trucks that aren’t touching the ground or by getting really long airtime. These points are used to purchase abilities such as double jump and slow motion (more useful than cool, trust me). This makes the core gameplay very fun. There are 10 zones for you to use your mad (or bad) reflex skills to go from truck to truck, and after you have completed the campaign, there are custom levels as well as a level editor, if you fancy driving people crazy on one of your levels. In conclusion, Clustertruck is a very unique gem of a game, it is the perfect example of what makes indie games great: one idea polished to perfection.